A lout born with foetal alcohol syndrome has been in court for being drunk and disorderly three times in six months. Burnley magistrates heard Anthony Herdman, who has learning difficulties because of the condition, was spotted half-naked and chasing a man. He was foul-mouthed and shouting: "I'm going to kill you." The 24-year-old, who also struggles to read and write, was gritting his teeth, swore at police and told them: "Get off me," as they went to detain him in the early hours trouble. The court was told Herdman had a record of 35 offences, which included public disorder and drunken outbursts. Miss Catherine Allan (prosecuting) said at 1-40am police in Nelson received reports from the CCTV control room of a man with no top on, holding a bottle, involved in a disturbance. Officers went to the location and saw a man running around the corner, being pursued by the defendant. They thought an assault might take place. Mr Mark Williams (defending) said: "He is subject to a community order. The response is very positive, particularly over the last few weeks." Mr Williams said the defendant couldn't remember what happened, but accepted what the police officer said. The solicitor continued: "He doesn't know what had happened to his shirt. He had no idea. All he knows is that he didn't have a shirt on when he was charged and released the next day." Mr Williams said Herdman had been attending the Jobcentre to try and get work. He added: "He is hopeful in time it may lead to some gainful employment." The Bench chairman said the defendant had two drunk and disorderly offences from April and now one in September and told him: "You need to stop losing your rag when you have been drinking. Get a job and get on with your life." 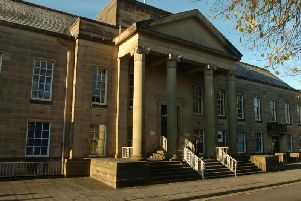 Herdman, of Hart Street, Burnley, admitted being drunk and disorderly on September 8th. He was fined £40, with £85 costs and a £30 victim surcharge.